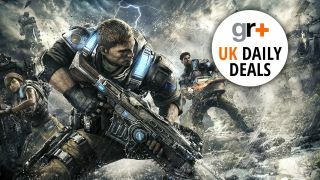 Deal of the day this week is an incredible Xbox One offer that bundles in a 500GB console with Gears of War 4 and a game of your choice for £169.99. While on the TV front then there's an amazing 50 inch 4K HDR TV for £529 with an impressive range of features. Elsewhere there's money to be saved on a range of games like Call of Duty Infinite Warfare, BioShock: The Collection and The Elder Scrolls Online. And there's a few more Xbox One bundles if you fancy some options. Hisence are killing it at the moment for 4K value. 50 inches, 4K and HDR for £530 is incredible value. This also packs in quad core powered smart functions so you can use apps like Netflix, Twitter and a built in web browser. On top of that, Anyview Cast and Anyview Stream functions let you share content from your smartphone, tablet or computer, and show it on the big screen. And you can use any USB memory to record from the TV. 4K isn't for everyone, whether it's price or simply that you don't need all those extra pixels. So this 40 inch basic HD TV is perfect, with great picture quality and a super low price saving you £150. You've got X-Reality PRO for great picture quality and the ability to record to any HDD you plug in, direct from the TV.